Microsoft made a bold move last month when it announced it would backpedal on the controversial online check-in and game sharing policies of its new console, the Xbox One. Many were happy with the decision; now the console won't have to check in online every 24 hours, and games can be lent, traded, and sold freely, just like they can are now. But when this Xbox 180 went down, some features were lost too, like the ability to share and trade digital games. Some gamers are taking action, with a new petition calling for Microsoft to "give us back the Xbox One we were promised at E3." "This was to be the future of entertainment," the Change.org petition with more than 13,883 supporters read. "A new wave of gaming where you could buy games digitally, then trade, share or sell those digital licenses. Essentially, it was Steam for Xbox. But consumers were uninformed, and railed against it, and it was taken away because Sony took advantage of consumers [sic] uncertainty." True, Sony directly addressed the Xbox One's controversial policies at E3 by sharing that the PS4 won't have the same problems. But is that really "taking advantage" of anyone? 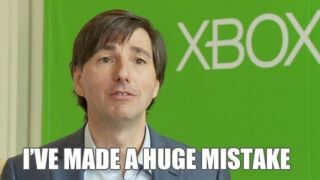 If Don Mattrick, the former Xbox Head that the petitioners chose for their figurehead was still at Microsoft, we reckon he'd be howling and pulling his hair out by now. Don't hesitate to check out more TechRadar blips while you're pondering which version of the Xbox One was better. Tell me...what inspired the Xbox One design?